With all the rapid changes going on in the fixed freestyle world over the past year, you’ve got to ask yourself, “when will the bikes stop evolving?”. First it was the forks. Everyone was snapping their steel forks. 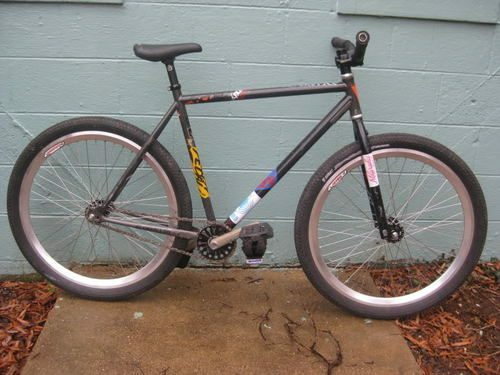 People upgraded to either a Brooklyn Machine Works Gangsta Track fork or a rigid 26″ unicrown. Shortly after, new framesets were designed specifically for fixed freestyle. Then came the bigger tires. A year ago, 35c was considered big and people argued relentlessly on Trick Track that bigger tires slowed them down. Now everyone’s on at least 38c tires and some have gone up to 50c. A few weeks ago, a thread started on Trick Track that addressed what everyone’s been wondering for months; why not 26″? 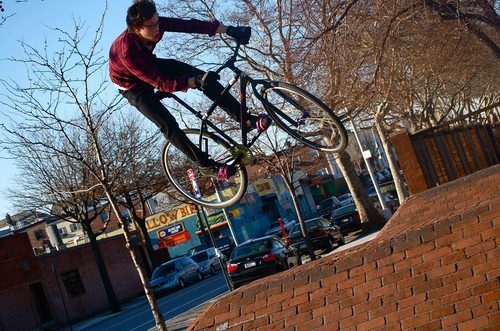 Julio from Richmond put 26″ wheels on his Charge Scissor and had to crimp his chainstays to gain tire clearance. Mike Schmidt did the same thing to his Leader. He’s got a 2″ tire in the front and a 1.8″ on the rear. In December 2008, Tom was in-between sponsorships. His BMW Gangsta Track was unridable and he had yet to receive any support from his new sponsor, Charge. 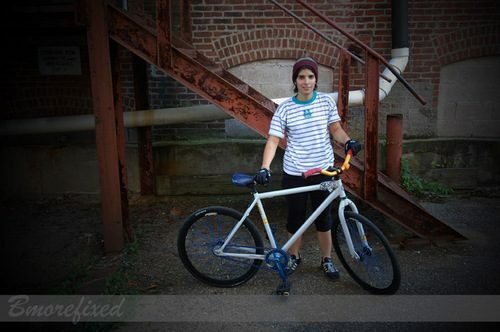 Tony lent him his 26″ Redline Monocog so he could ride in NYC one weekend. After some debate, Tom put on his components from his 700c bike (including the wheels) onto the frame and rode it. 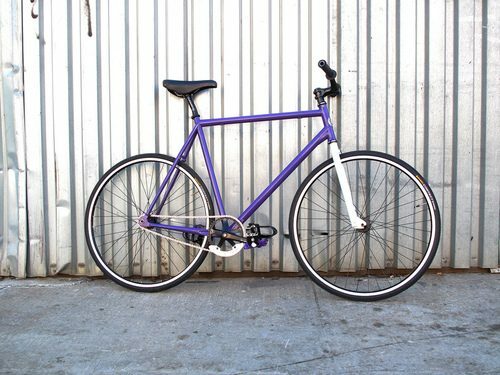 The geometry was really slack, the top tube was long, the frame was super compact and the bottom-bracket was really low; all less-than-desirable characteristics for a fixed gear. He still shredded on it though and only really complained about the wheelbase and bottom bracket. Later, he tried out a Surly 1×1 and had the same complaints. 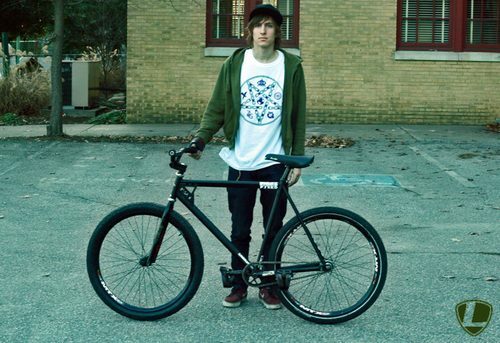 People at the time continued the “get a bmx” banter and Tom felt that there had to be a middle ground with a 26″ MTB frame and a track bike. Shortly after, he was riding a Charge Scissor. Around this time, I was on a Milwaukee Bruiser; a frameset I helped develop. These bikes were the first models to be designed with a 700c unicrown fork. Both had ample toe clearance with a 700c wheel, eliminating the need for a 650c front wheel to barspin. Here’s the first prototype Milwaukee Bruiser. Note the 32c tires and track cranks. The bikes changed a little bit, allowing even bigger tires and most of us switched to BMX cranks. This would open the door to even larger tire clearance. For instance, if you went with a mid-bottom bracket, you could squeeze a few extra mm’s of tire size in the rear triangle; in turn, you’d lose the 42-44mm track chainline. Another issue in which we’ll have to address later. Now, fast forward to modern times. There are a handful of riders on 26″ wheels, front and back, on a bike designed for 700c wheels. Some obvious issue come with this; bottom bracket drop, tire clearance and general bicycle handling. But are those issue enough to keep people from riding 26″ wheelsets? Especially with the added strength of a smaller-diameter wheel. Well, the current poll on Trick Track says that 49% of people who frequent the forum and took place in the poll are currently riding 26″ wheels.This leaves 17% undecided and 34% choosing the 700c route. Under this logic it seems that a 26″ rim with a 2″ tire will have a diameter right between a 700×19-20 tire. Something that Alex overlooks here is PSI won’t be the same on a 2″ tires as it is on a 25c or even a 35c tire. His math is correct, but a higher PSI and a larger wheel diameter will, generally speaking, make for a faster, more nimble bike. At some point someone pointed out that 26″ wheels aren’t ideal for actually riding distances, to which a commenter linked to Surly’s Long Haul Trucker with 26″ wheels. At first glance and by that logic, you could agree, but the reality is 26″ wheels are used when touring takes a rider to more remote areas. Along with their ability to handle in off-road conditions better than 700c, the 26″ wheels and wheel products are more readily-available in remote regions. Worldwide, the 26″ wheel is the most common wheel diameter. 700c wheels are more ideal for road-use and randonneuring riding. Larger wheels and larger-diameter tires will equal a more efficient mode of transportation; or so it is argued. Now, I’m not completely against 26″ wheels on 700c bikes. Hell, one of the biggest problems we had to face when designing the Bruiser was trying to get the same head tube angle on all size options. If we went 26″ on the XS and Small frames, the bikes would probably look a lot nicer, proportionally speaking anyway. 26″ wheels do offer a better stand-over for riders, especially since most 700c bikes are designed around a 28c tire. Which leads me to this point, as illustrated above; 26″ wheels on the larger bikes looks, well, retarded. (Sorry Young Gun). Now we’re at the cusp of a defining moment in 700cmx. Should we be designing bikes to fit 26″ or 700c wheels? 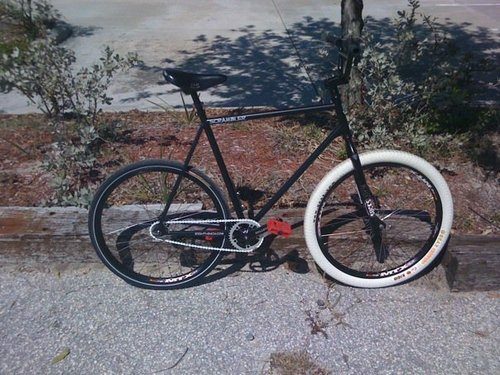 Or should we abandon the 700c wheel all together when it comes to the extreme urban fixed bikes? Will mid-bottom brackets and crazy-crimped stays allow for both 26″ and 700c? What about BB-drop? Remember, a really high bottom bracket will drastically alter your center of gravity on the bike. There’s no telling where this sport is going. It’s a slippery slope for sure and it seems like we’re digressing to 26″ MTBs, rather than fixed 29rs. Here are my thoughts. Instead of going for a smaller diameter rim (26″ has a bsd of 559mm and 700c has a bsd of 622mm), make a rear rim that is both wide (33mm would be ideal) and deep (+/- 35mm deep). The depth will allow you to use shorter spokes and when laced 4x on a 36h hoop, will be strong as hell. If you’re riding at least 38c tires, you shouldn’t trash this wheel. I’m 220 lbs and even though I’ve taco’d wheels before, I’ve also found this formula to be really successful. 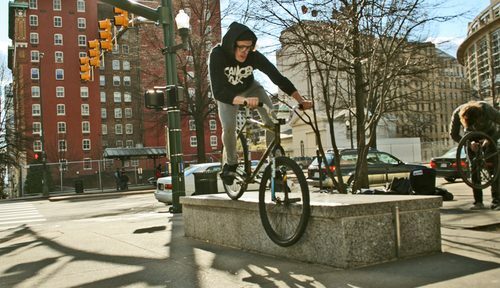 For instance, while filming for the Revival, I trashed a brand-new wheel by landing awkwardly on it off a jersey barrier. Afterwards, I laced the same exact wheel and have had it for over 6 months. It’s still in great condition too. The bottom line is; if you land awkwardly on any wheel, larger than 24″, you’re going to trash it. I think we need to embrace the 700c wheel as long as possible. It’s where all this came from and while you may feel like a 26″ wheel is the answer for freestyle, it may not be the answer to the urban-commuting / tricking bikes we’ve all come to love. If you feel like 26″ is for you, by all means, experiment and try it out, because that’s what brought us to doing tricks on fixed gears in the first place. Maybe you could also try riding a big bike (26″ mtb or a 24″ bmx) and see how you like that. Like most bikes, specialty is key and while I’m not saying 700cmx bikes are more suited for tricks, I am saying that they’re more suited to their current state as a commuter / freestyle bike. I know it’s still fixed, but at what point will the fixed drivetrain become the thing that’s hindering the sport? Much like the 700c wheel is hindering the sport now? Who knows though, seeing how fast these bikes have evolved, their progression (or regression) is unpredictable. There are tons of points I’ve overlooked here, so feel free to comment below, or engage in the discussion on Trick Track.